Susan Johnson: A Big Life, Macmillan Australia. Published in Overland 135, Winter 1994. 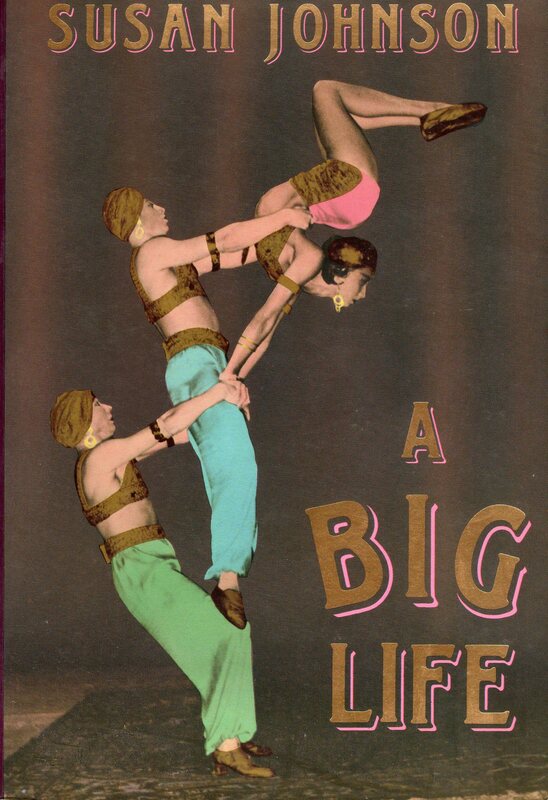 In many respects, The Big Life is Susan John­son’s ‘big novel’. Published by Macmillan in Australia, it was picked up by Faber in the UK and the US and received some enthusiastic early reviews. While Johnson has established a reputation as one of the more interesting emerg­ing novelists with her first two novels, The Big Life represents a number of important depar­tures for her. It is, for example, her first novel where the central character is male and where most of the novel is set outside Australia. The novel’s main character, Billy Hayes, is an Australian tumbler who works the variety stages of England during the 1930s and 40s. A Big Life opens with his birth during World War I. The youngest of six children, Billy spends the first few years of his life without his father, who left for the war before his wife knew she was preg­nant. Billy’s mother Sapphire Hayes runs a happy, loving house full of laughter. She feels Billy to be special, if a little fragile: “Out in the open this baby needed all her comfort, for there was something too tender about him”. Just before Billy turns five his father returns and takes an instant dislike to the son he didn’t realise he had. This dislike grows to hatred when Billy meets the young Chinese acrobat Reg Tsang. Eventually Billy’s father sells him to a tumbling act returning to England. His ‘big life’ really begins on the ship on the way to England. He becomes part of ‘The Wallabies’ with Veron Rome and Connie Connor (who are also his legal guardians). Later he meets and marries Bubbles Drake and leaves ‘The Wallabies’ to set up his own act with Reg Tsang. After the war Billy pro­duces The Hope Show’, briefly capturing the imagination of a war-weary nation. Just as his career appears to have reached its climax, however, Bubbles sues for divorce and for the first time in his life Billy has to deal with failure. There is a naive simplicity to Billy’s character which is both endearing and infuriating. He has no sense of direction but, like the tumbler he is, always seems to land on his feet. But while Billy may be able to balance perfectly on stage, in real life he is too self-obsessed to consider the feel­ings of those around him. So while he obviously loves Bubbles, he is incapable of reconciling his own desires and ambitions with hers. He is con­tinually demanding more of her and when she finally lets go he overbalances. In his search for ‘the big life’ Billy lives the life of an exile. At one point he asks, “How had he ended up so far away? Only economics, politics, or disaster were supposed to force people into exile: no one willingly chose it, or at least not ordinary men like himself.” But Billy isn’t really in control of his life: he leaves Australia because his father sells him and he stays in England because nobody arranges for him to return to Australia. Bubbles organises his domestic life and his agent organises his professional life. Billy’s passivity has effectively made him as much of an exile as any refugee. The impact of A Big Life lies not in the narra­tive of Billy muddling through his life, but in the strength of Johnson’s writing. There is an economy of style which perhaps owes some­thing to her journalistic background. But it is a deceptive economy for, as the narrative pro­gresses, the complexities are building up under the surface. In the same way that Billy can keep tumbling while a depression and a world war unfold around him, the reader can easily find they are being seduced by the carefully under­stated descriptions so that the border between stage and reality begins to blur. A Big Life is certainly an impressive novel but it is not without flaws. I found Billy’s character to be a little too unsympathetic and, towards the end, I didn’t really care what happened to him. As a result the novel lost some of its impact in the final chapters. Nevertheless, The Big Life is a major achievement which should serve to further enhance Susan Johnson’s reputation.